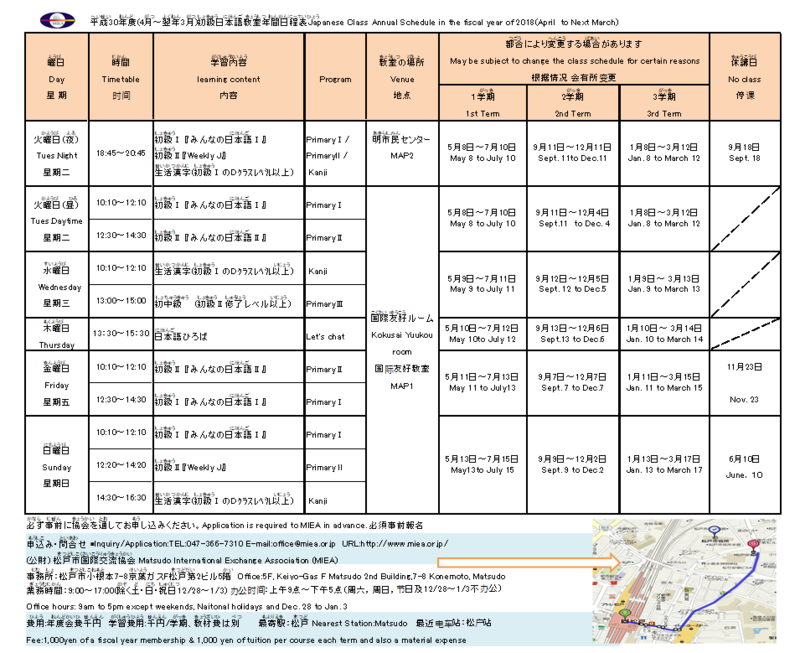 Welcome to our website - "Association of Japanese Language Volunteers in Matsudo City". We are conducting Japanese language classes to support foreigners residing in or near Matsudo city. Please come and join us. Let’s study Japanese language and have fun together. ※１、※２ Venue: to see MAP1/MAP2 of Access Map, please click here. Primary Ⅰ：　For students who have just started studying Japanese language (A/B/C/D classes). Primary Ⅱ：　For students who have completed Primary I ("Minna no Nihongo I"). Primary Ⅲ：　For students who have completed Primary Ⅱ（"Minna no Nihongo Ⅱ" or "Weekly J"）. Kanji ：　For students who are at the level of, or higher than D class of Primary Ⅰ. Let's chat：　Any student can attend this class regardless of the level. ・Fee: 1,000yen per class for one term. ※After the class you will attend is determined please obtain your own textbook. Our association and MIEA do not sell the textbooks except for Kanji class. Copyright (C) jlvmatsudo.cloud-line.com All Rights Reserved.